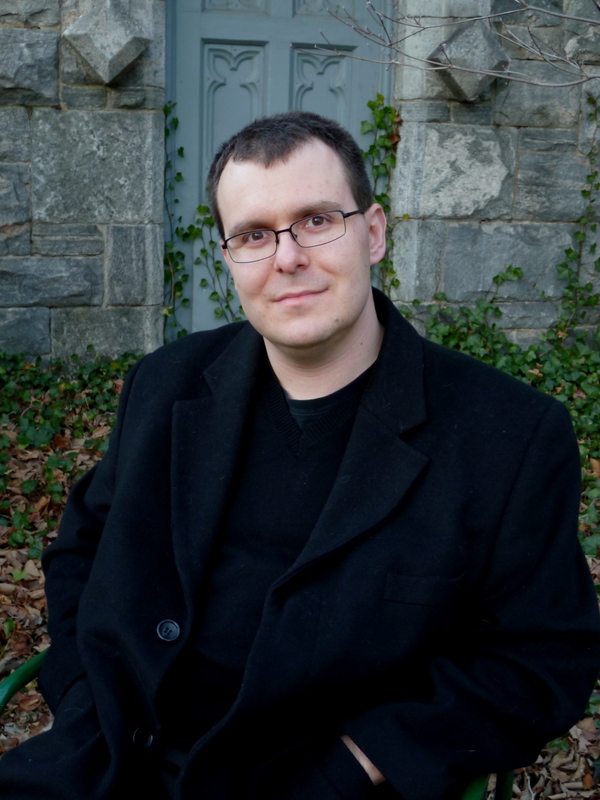 Our guest today is Django Wexler, debut author of the military fantasy novel The Thousand Names (which, spoiler alert, Thea highly enjoyed and will be reviewing later today). For his post, Django is taking inspiration from a Napoleonic phrase: March to the Sound of the Guns! (a phrase for a subordinate commander to march his troops towards the sound of cannons to get in on the battle). That is, Django is talking to us about one of his biggest pet peeves (and one of OUR biggest as well), that dreaded waiting period in which nothing is happening in a fantasy novel. Please give a crisp salute to Django, everyone! It may be unpopular, but I would like to express the following controversial opinion: I think that things should happen in books. Okay, so it’s not that controversial. Obviously, you say, things should happen in books. But I would wager that anyone who reads widely has had the experience of picking up a book and getting bored because nothing was going on. If we all know that things should happen, why do they keep not happening? In my experience, there are two primary ways in which things fail to happen. The first has to do with excessive back-story, exposition, or description, and the second is a matter of character investment. They’re quite different problems with the same symptom—a bored sense of detachment on the part of the reader. In the first case, literally nothing is happening in the book. This can be because the author has decided we need to know every detail of a character’s genealogy or a world’s mythic history before we can get started, or because he or she is obsessed with describing every aspect of the architecture. It can be simply a matter of the writer being in love with the sound of their prose, or a case of the magic system or science-fictional conceit being so complicated that a primer and glossary are required to make sense of the terminology. Whatever the reason, the result is reams of pages where no action takes place. At other times, the problem isn’t in the description or the exposition per se, but rather in where these passages are deployed in the structure of the novel. If the book involves a complicated magic system, we probably need to know about it at some point (at least as much as the characters do), and if the hero’s genealogy really is important to the story you’re probably going to need to communicate it to the reader. But it is almost never a good idea to put that sort of thing up front, as a giant wad of indigestible material that the reader needs to chew through to get to the tasty part of the book. In general, readers will be happy to absorb reams of background material, if you give them a reason to care about it. That means that the proper place for this kind of exposition isn’t before something happens that involves it, but afterward, once the reader has a character that they care about who needs to know it. So start with the cool action scene or by establishing a character, so that by the time the protagonist says, “Wait, he can’t be my father!” we’re ready to hear how the genealogy works out. A time-honored technique is to include a character who doesn’t know everything already, so that one of the other characters can explain things as they go along. When used well, this is a deft way of slipping information in that doesn’t feel boring. In The Thousand Names, I use this for two important purposes. First, since the main characters start the book unaware that magic is real, I get the chance to enlighten the readers on the true nature of things as we go along. Second, when Winter inherits command of a company of raw recruits, it provides an opportunity for some unobtrusive lessons on weapons and tactics, so the reader knows what to expect when the shooting starts. The second case of “things not happening in books” is more complicated. You can usually diagnose this one by trying to explain the plot to someone—if it comes out sounding like, “This guy met this girl, and then some other stuff went on,” you’re dealing with this problem. In this case, it’s not that nothing is literally happening—the text describes events that occur—but rather that we don’t care. This is a more subtle difficulty, because it has a lot to do with the context. Suppose I wrote a chapter in which our protagonist, Bob, gets out of bed, brushes his teeth, realizes he’s out of milk, and drives to the store to buy some. In some contexts, this could be perfectly legitimate action. If the book is about the decaying relationship between Bob and his wife, say, the details of his morning might be relevant, even gripping. The same might be true if we know from previous events that there’s a dead body in Bob’s trunk, so that when he goes to put the groceries away he’s going to get a nasty shock. But if the story is about Bob’s career as an intergalactic fighter pilot, the “morning errands” is not something the readers care about. As a result, they might complain that nothing happens—not literally nothing, but nothing of importance, however importance is defined in the context of the book. As with the first variety of problem, sometimes the answer is to simply cut, cut, cut. Just snip out Bob’s morning errands entirely, and the book will ultimately be the stronger for it. Again, painful but necessary. Sometimes, though, the problem is a little bit deeper—the author thinks the readers should care, but they don’t. This can be a matter of structure, similar to the above. While we have a tendency to be in sympathy with the viewpoint character, it’s not automatic, and it takes a little bit of time to build up. If we will eventually care about Bob and his groceries, but don’t yet, the beginning of the book is not the time for the morning-errands scene. Multiple points of view can also present a problem; if there are too many points of view, the readers may not care about some or all of them. Or the character may simply be poorly drawn; a mess of contradictory traits that feels like a ball of mush, doing whatever furthers the plot or a cardboard cutout embodying some trope or cliché. All writing advice is tentative, and all writing rules are made to broken. But “things should happen in books” is pretty good advice, I think, for the majority of writers. If your readers come back to you complaining that nothing happens in your book, something is probably wrong, and the first step to finding out what usually begins with asking yourself whether anything does happen, and whether you’ve given the audience any reason to care. The Thousand Names, Book One of The Shadow Campaigns! Follow Django on his website, blog, facebook, or on twitter (@DjangoWexler). 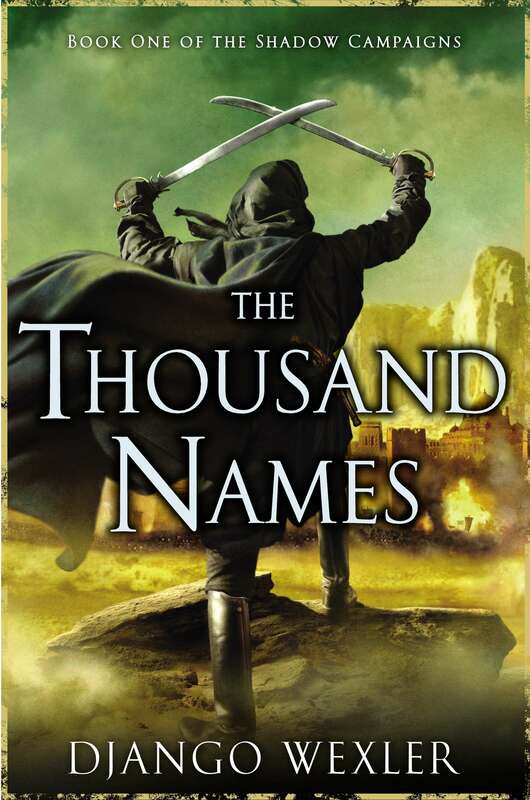 We have ONE copy of The Thousand Names up for grabs! The contest is open to ALL and will run until Sunday, July 14 at 12:01am. To enter, use the form below. Good luck! It seems that I have read very few military speculative fiction, i.e. none of the examples listed. However, my favorite that resembles military speculative fiction is Timothy Zahn’s work. Stargate- from the film to the books to the TV spin-offs. I can’t say that I’ve read much military speculative fiction, but John Scalzi’s Old Man’s War books are on my metaphorical To Be Read Someday pile. Surprisingly I do better with movies/TV – I loved 300 (it has enough legend and myth in it that I consider it speculative fiction), and Firefly. Dear Lord, do I love Firefly. I think I’m going to go with my most recent qualifying read here – The Black Company, with the caveat that you have to start at the beginning of the series. I read one of the later volumes first, and it made very little sense to me at the time. I would go with Tanya Huff’s Valor series, I vastly enjoyed that. Military Fantasy = The Malazan Book of the Fallen. An ode to compassion that’s one of the most heart-wrenching, frutrating and rewarding experiences I’ve ever had as a reader. Hmmm, I might be able to get my non-fantasy reader friends to pick this one up, with the military angle. Sounds exciting! Oh, and I’ve been remembering the 1980s era show Max Headroom, esp since an actor on that show was just killed off in Falling Skies. As always, the Vorkosigan series (which is SO much more than a military series, but I would like to add the Valor series by Tanya Huff, Firefly/Serenity and Karin Lowachee’s Warchild, with its two sequels. Hands down, Firefly. One of the best shows ever made. I loved Firefly and I am dying to see the Ender’s Game movie. I hope it is as good as the book! Battlestar Galactica! Any other fans here? I’m not sure if this expressly counts but I LOVE David Gemmell’s Troy trilogy that starts with Lord of the Silver Bow. It’s a historical fantasy with a heavy military bent. Such an amazing series. I think my favorite military spec fiction would have to be Battlestar Galactica. There were so many different themes the show covered, but it always had the overriding presence of military and its consequences at its core. Does Terry Pratchett’s Monstrous Regiment count? That’s so hard, because I have several favourites. But as so far it’s mostly been military science fiction that has been mentioned, I’ll go for military (urban) fantasy and say Myke Cole’s Shadow Ops series. I would have to say Firefly, I love the old west meets space feel of the series. I’m loving Scott Westerfelds steampunky Leviathan series, it pits modified animal/machine hybrids against steam powered robots and clankers! For shows, Star Trek all the way. For books, definitely Ender’s Game. The Warrior’s Apprentice, by Lois Bujold. Followed closely by David Weber’s Honorverse, at least the first few books, before they got kind of grandiose. I love Miles Vorkosigan! Firefly is also amazing. Other than that, I recently read the first Honor Harrington book and had a really great time with it. I’m hoping the rest of the series turns out to be just as fun. Does Star Trek count? I like Deep Space Nine. My favorite military fantasy have to be the first two Malazan novels, Gardens of the Moon and Deadhouse Gates, and particularly Deadhouse Gates. Steve Erikson did a great job of telling a story focused on military units and giving each character enough detail to feel you know them. You’ve already mentioned Vorkosigan novels which I really like, and I also liked the new Battlestar Galactica series. I love Ender’s Game so much that I won’t read the sequels in case they ruin it. Like someone else said as well, Scott Westerfeld’s Leviathan trilogy is superb. I don’t know that I have a favorite. I have a secret horror of miscategorizing books, so I’d rather not venture a guess. It has to be Star Trek: Deep Space Nine, although it is a really tough choice, because there are so many wonderful options.